The President of the United States advocates torture, predicting another 9/11 “that will make the last one pale in comparison.” A neoconservative Vice President continues to lobby for war against Iran. The GOP candidate pushes to end restrictions on off-shore drilling as oil prices continue to rise. And now the latest announcement – Western oil companies will be running Iraq’s oil fields on no-bid contracts. All part of this summer’s headlines…or excerpts from a startling new book tell-all written more than two years ago! 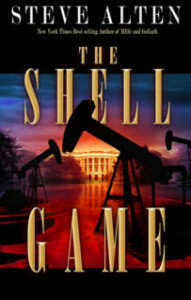 Best-selling author Steve Alten’s latest book, The SHELL GAME, is an explosive thriller that continues to startle readers by accurately detailing domestic and world events BEFORE they happen. The author’s sources include insiders in the military, special ops, the oil industry, and foreign affairs, all contributing in an attempt to stave off what could be coming down the road. . . an October surprise intended to launch the GOP candidate into office and the U.S. into a WMD attack on Iran. Says Alten, “Scott McClellan’s book gave us a peek behind the White House curtain. According to a growing list of industry experts, world oil levels peaked in 2005. Supplies are in a terminal decline that will lead to higher prices (and oil company profits), increased conflicts in the Middle East and other petroleum hotspots, accompanied by an economic tailspin, widespread blackouts, and famine. Jeffrey Stephens’ First Novel, The Portofino Deception, Consistently Draws Rave Reviews from NY Times Best-Selling Authors! The Portofino Deception is the premiere novel of Jeffrey Stephens and has again received top reviews, the most recent being from Steve Alten, NY Times best-selling author of Meg and The Shell Game. 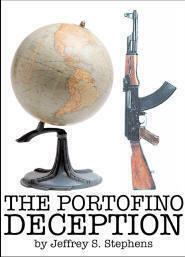 “Jeffrey Stephens takes the reader on a fast-paced tale of international intrigue and suspense in this, his first novel, The Portofino Deception. With a terrific lead character in Jordon Sandor, and many plot twists, I look forward to watching Stephens develop as a topnotch author,” says Steve. Sandor discovers that the rogue agent behind the plot is his former mentor and Jordan realizes he is the only man who can prevent the catastrophe. This journey takes him from Woodstock to New York City to Fort Lauderdale, then to Paris and ultimately to the beautiful Italian Riviera town of Portofino. It is an edge-of-the-seat adventure with an energy that never stops. Welcome to the Ascot Media Group blog. Please check back soon for exciting new entries.